Over the years, we have donated funds to causes that are important to us. Sometimes we give a portion of proceeds of our website sales, as was the case with September 11, 2001 and the Tsunami of 2004. For other causes, like Breast Cancer, Breast Health and Ovarian Cancer we have created a special color, and a portion of the sales from which are donated to a charity or group of charities. These shades are also available in refills for your Refillable Trio Compact. A Sheer Cool Pink with a Healthy dose of Gold Shimmer. 20% of the purchase price will go to City of Hope in Los Angeles. The Gloss comes with a Pink Gingham Pouch designed by Shoshanna while supplies last! This is a sheer, shimmering pink Lip Gloss created to emulate the symbolic breast cancer ribbon. The original Gloss was nestled in a limited edition pink gingham drawstring pouch created by designer Shoshanna Lonstein. 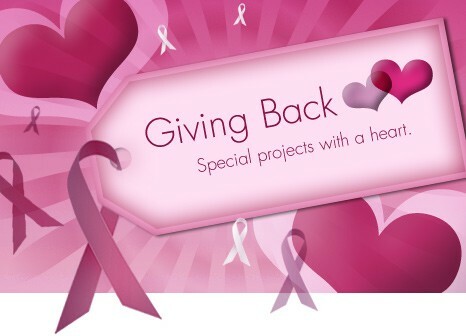 A portion of proceeds are being donated to breast cancer charities. This is a sheer, sparkling lavender infused with sun protection. When this was first launched, it was available in a limited edition multi-colored cosmetic bag by INCA BAG. This gorgeous gloss is still available and a portion of the proceeds are donated to the Ovarian Cancer cause. A pink pearlescent lip gloss inspired by images of Sprites and Princesses perfect for any skin tone. A portion of proceeds benefit Children's Heartlink.